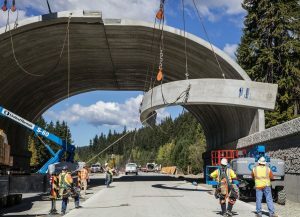 In summer 2016, the Washington Department of Transportation installed the first arch over the westbound lanes of I-90 that will support the first wildlife overpass constructed in the 15-mile I-90 Snoqualmie Pass East Project. Each arch constructed requires approximately 40 concrete segments. 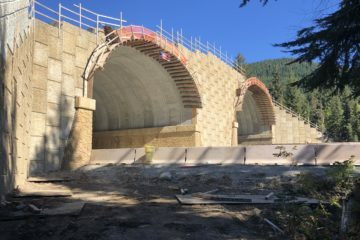 Once the wildlife overpass is complete by winter 2019, it will be 160 feet wide and vegetated from the forest around it. Speaking at the groundbreaking event for the wildlife overpass, Jason Kuiken, deputy forest supervisor of the Okanogan-Wenatchee National Forest, said projects like the I-90 overcrossing help reconnect fish and wildlife habitat and exemplify the mission of the Forest Service. “This is truly an exceptional project that extends well beyond the place we are today, “said Kuiken.